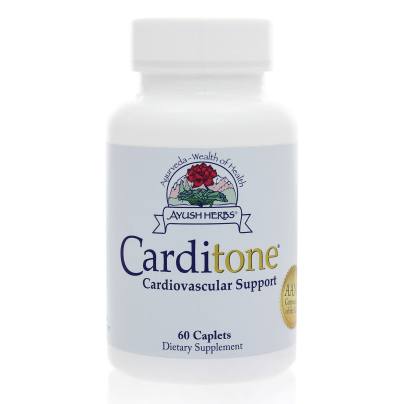 Carditone is a combination of patented extractions of Rauwolfia, which has been used traditionally to support blood pressure levels already within the normal range and also has calming properties, and several other herbs and minerals. Terminalia arjuna is traditionally used as heart support; Tribulus terrestris and Boerhaavia diffusa are considered renal supportive; rose powder has calming effects; and magnesium supports cardiovascular health by helping to maintain healthy level of calcium and potassium*. Take one (1) caplet one (1) time daily or as directed by your physician.